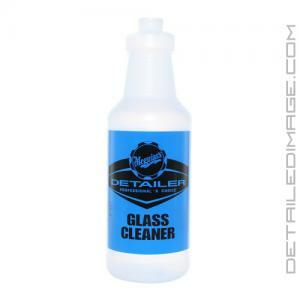 Meguiar's Glass Cleaner Bottle (32 oz) is the perfect bottle to pair with the Meguiar's Glass Cleaner D120. This bottle is color coded and pre-labeled as "Glass Cleaner" so you will never confuse this product for another. It is also OSHA compliant so it meets all of the government's guidelines for occupational safety. It does not come with a trigger but the DI Accessories Chemical Resistant Spray Trigger is a perfect fit and it is chemical resistant so it will withstand the powerful cleaning agents in the D120, or any other chemical you may be using. The bottle is 32 ounces and has measurements on it to help you dilute the D120 properly. If you are looking for a durable bottle that is pre-labeled to help avoid confusion then the Meguiar's Glass Cleaner Bottle is for you. When a customer see's the Mequiars bottle labeled glass there instanly impressed & seem more satisfied that professional products are being used. I've noticed workers like displaying the bottles as well. It helps them with the next steps & process of a detail. Wonderful idea by Mequiars. This bottle is very easy to tell which product you have in it. Each bottle is also colored labeled making it easy to tell each one by just looking.